Congratulations to Graham Wallis (DRV), who has been awarded the highly coveted Park Street Course Setter of the Year award for 2018-19. Graham won for his course at Kingsclere, in the Monday Summer Series. He receives a Park Street Season Ticket to the series of his choice. Mentone Racecourse – the map includes a very unusual street layout, plus three large “dead areas”. Tim did an excellent job of incorporating these “dead areas” into the course, plus, critically, locating controls so as to have genuine route choice and control choice even in the “dead areas”. 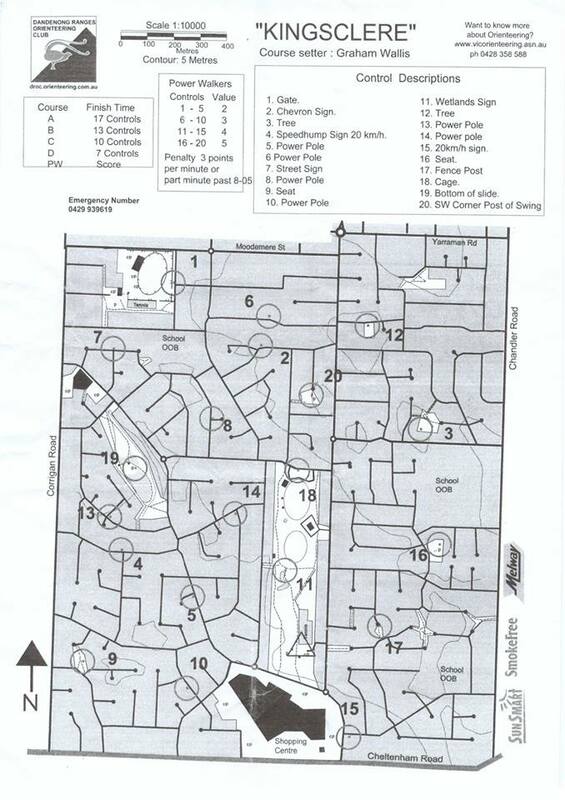 The course included many viable route choices on most courses, plus good map presentation. Skeleton Creek – the map includes an uncrossable creek with only two bridges. Fiona did an excellent job at setting a course with well placed controls on both sides of the creek, where even the shorter courses could be tempted to cross the creek. Good route choice and control choice was available on all courses. Perhaps the only slight weakness was a string of controls leading to and from the northern bridge that were likely a “one way” run for the longer courses – but overall, a well thought out and presented course. Kingsclere – scored highly in all areas – including control choice from the start and the relative lack of “one way / dead areas” of the course. Graham did an excellent job of providing maximum route choice and control choice for all courses. Even the shortest course could conceivably visit the majority of controls on the map. I still could not work out some of the shortest courses despite spending significant time studying the map. Also included a tricky control 15 near the start where competitors had to make an instant decision at the start to get it first, or drop it all together. An excellent overall map and worthy winner. Well done Graham!